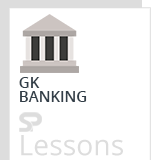 Banking Awareness Quiz 1 – Practice Sets article provides the list of several bank related questions to prepare aspirants of different competitive exams in India, primarily for banking related employment. The article Banking Awareness Quiz 1 – Practice Sets is very useful for different exams such as IBPS PO, Clerk, SSC CGL, SBI PO, NIACL Assistant, NICL AO, IBPS RRB, Railways, Civil Services etc. Q1. Which is the first Indian Commercial Bank that was fully owned and managed by Indians? Q2. Which bank has started as a private shareholders bank, mostly by European shareholders? Q3. Which was the first indian bank started solely with Indian Capital? Q4. In which city the head office of Corporation Bank is situated ? Q5. Which of the following statements is/are true about NABARD? A. It is a development bank in the sector of Regional Rural Banks in India. B. It provides and regulates credits in the rural area. C. It gives assistance for the promotion and development of rural sectors, mainly agriculture. D. It finances rural crafts. Q6. Which of the following statements is/are true about Co-operative Banks in India? A. It has a three-tire set-up. D. It functions on sound business principles. Q7. Fiscal policy is related with which of the following? Q8. What is the function of IRDA? Q9. Which of the following organization decides Repo Rate? Q10. What is/are true about IMF? Q1. In which year Vijaya Bank was nationalized? Q2. Who is the chief of IMF? Q3. Which of the following is not a bank- related term? Q4. Which of the following is not a Bank? Q5. Which of the following is not a Foreign bank? Q6. What is /are the main aim of financial inclusion? B. to control the money supply in the economy. Q7. What is known as the certain percentage of bank deposits which banks are required to keep with RBI in the form of reserves or balances? Q8. Which of the following statements is/ are true about Marginal Standing Funding ? Q9. The rate, at which RBI lends money to commercial banks against securities when commercial banks has fewer funds for Short-Term, is/are known as which of the following? Q10. What is the main tool to control the money supply in the case of banking? Q1. Which of the following is the first bank of India? Q2. Which one of the following is the largest Foreign Bank in India ? Q3. Which one is the First Regional Rural Bank in India? Q4. Which of the following is not an initiative taken by RBI and GOI towards financial inclusion? Q5. Which of the following statements is/ are not true about Pradhan Mantri Jan – Dhan Yojana? C. It provides various different profit to account holder like insurance cover, overdraft facility, Atm card etc. Q6. Which one is the first bank to introduce robot in banking service? Q7. Which of the following is not a Public Sector Bank? Q8. Which of the following banks first introduce voice biometric in banking system? Q9. What of the following statements is/are true about Green Banking ? Q10. Which is the first Indian bank outside India? Q1. What is a Bad Bank? Q2. NPA stands for which of the following? Q3. PARA stands for which of the following? Q4. Which of the following is/ are the function(s) of World Bank? Q5. Which of following banks has established an exclusive vertical for NPA recovery? Q6. Which of the following statements is/are true about Bitcoins? Q7. IMPS stands for which of the following? Q8. Which of the following is not an advantage of Bitcoins? Q9. NPCI stands for which of the following? Q10. Which of the following statements is/are true about PAN? Q1. On which year NABARD was established? Q2. What is/are the objective(s) of IMF? Q3. The head office of UCO Bank is located at which city? Q4. The economic growth of a country can be measured by which of the following? Q5. Fiscal Policy is concerned about which of the following? Q6. Which of the following Banks Plans to set up 100 digital villages to promote Digital Banking? Q7. Which of the following statements is not true about the upcoming Rs. 500 currency notes? Q8. The first Paytm Payment Bank is located at which city? Q9. Which of the following is not a feature of upcoming Re. 1 note? Q10. NEFT stands for which of the following? Q1. Which of the following is not a feature of Paytm Payment Bank? Q2. Which of the following steps has taken by the RBI to tackle bad loans? Q3. Who has appointed as the CEO of Bank of India by ACC? Q4. JLF stands for which of the following? Q5. The head office of Union Bank of India is situated at which city? Q6. CRR stands for which of the following? Q7. Which of the following statements is true about Deflation? Q8. PLR stands for which of the following? Q9. Which of the following is true about FII? D. It includes Pension Funds, mutual funds etc. Q10. IPO stands for which of the following? Q1. What is the main feature of MUDRA Bank? Q3. Which of the following statements is/are of true about Sensex? Q4. NBFC stands for which of the following? Q5. Which of the following is not a Credit Rating Agency of India? Q6. SEZ stands for which of the following? Q7. Who is the chairman of SEBI? Q8. Which of the following statements is/are true about KYC? Q10. Which of the following statements is not true about Bharatiya Mahila Bank? Q1. AEZ stands for which of the following? Q2. What do you mean by Amount at Risk? Q3. ABM stands for which of the following? Q4. Which of the following statements is not true about bankruptcy? Q5. Which of the following banks has the largest number of branches in foreign countries? Q6. General Insurance does not provide protection in which of the following? Q7. What do you mean by Minimum Cash Reserve? Q8. Which of the following is a Demat Account? A. Accounts which facilitate repayment of a loan taken from that bank. Q9. Currency notes those are deposited in the currency chest are the property of which of the following? Q1. Which term is known as a fixed deposit receipt that is kept with the bank for its safety? Q2. Which of the following is the primary regulator of Banking business? Q3. A bank can refuse open an account on behalf of which of the following? Q4. What is the purpose of reporting by the banks about suspicious transactions to the anti money laundering committee? Q5. If a non – banking financial company wants to collect public deposits it is governed by which Act? Q6. Which of the following statements is/are true about inbsolvency? Q7. What is Lead Bank? Q9. The head-office of Indian Overseas Bank is situated in which city ? Q1. What is the main source of National Income of India ? Q2. CBS stands for which of the following? Q3. What do you mean by NNP of a country? Q4. What do mean by Mixed Economy? Q5. What do you mean by Net National Product of a country? Q6. MAT stands for which of the following? Q7. What is Green Index? Q8. NDTL stands for which of the following? Q9. Which is not an Apex Institution? Q10. NAV stands for which of the following?